Everyone has been bitching about the dramatic rise in price of oil lately. Granted, it's putting a serious dent in consumers' wallets, and it's frustrating to see Big Oil making record profits due to market speculation. At the same time, I am secretly cheering this dramatic price increase, because it's the only way to stop this oil madness - people driving SUVs that they really don't need, people driving into work when they could take public transit, encouraging the auto industry to come out with more environmentally-friendly cars. Unfortunately, it appears that the price of oil is starting to drop, and that worries me a bit. Humans, it seems, have very short-lived memories. When given the opportunity to return to their excessive ways, they will do so in a heartbeat. Case in point, remember the blackout of 2003? The blackout made us all painfully-aware of our dependence on electricity for our daily lives, and made us realize that we take it for granted. Well, at least it made us feel that way for a couple of days (if that). But the feeling passed, and we were back to our old power-hungry ways once again. If you doubt me, just take a look at the blatant abuse of electricity at Dundas Square or on the Gardiner Expressway, both in Toronto. It's shameful. 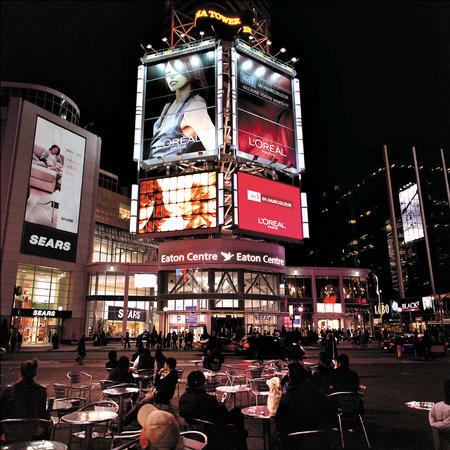 Dundas Square has attempted to imitate New York City with its big, flashy electronic billboards. I already find billboards to be an assault on my eyes, but combine that with the fact that most of them are electronic, and it's just plain abuse of the power grid. It's even worse on the Gardiner Expressway. As with Dundas Square, the Gardiner Expressway is littered with billboards, many of which have giant TV screens. Am I the only one who thinks that a) this is a waste of electricity and b) this is a driving hazard? WTF??? Conservation of power and fuel is so easy, yet we North Americans seem to live under the "bigger, better, faster" mantra, not realizing what it does to the world around us. Namely, depletion of non-renewable resources such as coal and crude oil. So yes, I hope that the price of oil skyrockets, because that's the only way that we are compelled to conserve.